Yes, it is definitely Christmas at The Queen Victoria. Every where you look you see evidence of it. Literally every corner of the inn, every nook & cranny (how often does one actually get to write the word “cranny”?) is filled with some type of Christmas decoration. About the only thing we don’t have is a train set. I’m telling you, one can’t help but be drawn into the Christmas spirit with all of this Christmas Cheer everywhere. I’ve always been kind of a “Schrooge”, slow to get into the spirit of things. Sure, I’m there at the end, but don’t rush me. For some reason, though, I’m really in the spirit of the season early this year. I am completely on board with all of it. It scares me a little! Actually, I’m really enjoying it, as are all of our guests. If you need a Christmas attitude adjustment, my suggestion is to pick up the phone and book a room for a couple of nights this Christmas season. I guarantee you, you’ll leave feeling refreshed and full of Christmas Cheer. You’ve undoubtedly heard of Charles Dickens. You’re probably most familiar with “A Christmas Carol”, which is a staple during the Christmas season. 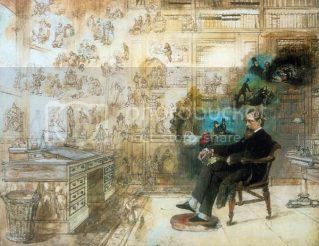 What you really NEED TO KNOW about Dickens, however, is that Cape May hosts a Dickens Festival every December. I’m excited to tell you that this year’s event is going to be exceptional. The Queen Victoria has partnered with MAC to put together an amazing 3 day program filled with world class entertainment, informative lectures, tours, wine tasting and two incredible feasts. You really don’t want to miss this event! If you’re looking for something more out of the Christmas season this year, something special and different, then the Dickens Extravaganza may be just the ticket. Registrations for this year’s event are already up significantly. We’re looking forward to spending time with the interesting and fun loving group that have already reserved their seats (and rooms). Why don’t you add yourself to this group and join Anna Marie and me for 3 very special days in Cape May? You’ll be so happy you did! Do you know what the definition of frustration is? It is knowing what the world’s BEST Christmas gift is, and not being able to get one for my beautiful and completely deserving wife. Seriously, do you think I could possibly get away with giving Anna Marie a gift certificate to The Queen Victoria? Even though she is the first person to agree that a Queen Victoria gift certificate is the best possible gift in the world, she would probably feel as if I cheated somehow in giving her one. It doesn’t seem fair. The good news is that you don’t have that problem. If it is for your significant other, then you’ll get to enjoy it too! I could go on and on, but you’re getting the idea. Call us today, or visit our website and get the the perfect gift for your loved one(s). OK, I promise that this is the last “Christmas” oriented segment of the newsletter. I just couldn’t leave out a personal invitation to join Anna Marie and me for Christmas this year. I’m not talking about the Christmas season generically here, but rather Christmas itself. You know, December 25th. The BIG day. Every year lots of folks find themselves searching for a special place to celebrate Christmas. Perhaps their kids are with the “in-laws” this year, or maybe they can’t travel to be with their family. Some families search for a centralized place to gather for Christmas where nobody has to play host. The reasons are endless. I’m pleased to say that The Queen Victoria IS that special place if you are searching for it. We already have about 50 people joining us for Christmas this year, but we still have room at the inn for you. Give us a call to make your reservations for a special Christmas this year. You’ll be so happy you did. Picture it: You’re facing a bleak, cold, boring weekend in the middle of February with nothing to do. The holiday season is a distant memory and a sunny bright Spring is hard to imagine. Football season is well past and there is simply NOTHING to do. But wait! Let me suggest a different scenario. What if there was a warm, bright, festive event filled with great wine, good food and wonderful company that you could enjoy? Imagine yourself sitting in a charming winery, blending (and sipping) wine, competing for the title of “Best Blend”. Imagine the fun, the camaraderie, the adventure of crafting a fine wine! You’ll arrive on Friday, hopefully in time for afternoon tea and a wonderful dinner out at one of our great restaurants. 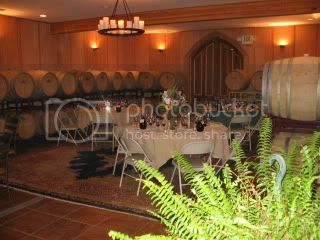 On Saturday afternoon we’ll gather at the Cape May Winery and settle into the barrel room for the afternoon. As you enter the room you’ll see several tables laden with decanters of wine, loads of wine glasses and a few measuring cups (remember, this is science). Each table becomes a “team”. First we sample each of the 4 blending wines (all red) to get a feel for their various characteristics. Then we start blending for an hour or two. Ultimately, each table selects its finest blend and mixes up a decanter of it. We then break for a tour. After the tour we return to our tables and do a blind taste of each team’s blend. We vote on the best blend, which is then bottled with a custom label with your name on it (or anything else you want printed on it). We usually have some left over wine from the afternoon, which we’ll then bring back to the inn, just in time for tea. This is sure to be a wonderful event. I hope you’ll join us! I’ve been teased by friends and guests about making such a fuss over our cheese tasting weekend. I am unrepentant, however. The Big Cheesy (I think it was mostly the name I was teased about, to be honest) is certainly one of the most enjoyable events at The Queen Victoria each year. It deserves a mention here. The name of this weekend pretty much says it all. Each year we gather fine cheeses from all over the world (we don’t actually travel around the world to find them, of course). You might be surprised to discover just how many different cheeses there are. If you know cheese, you know just how different they can be. If you haven’t explored the nuances of the myriad of different cheeses, then you haven’t really lived yet, and you definitely need to call us and make a reservation. 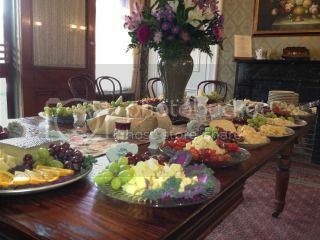 We’ll have 15-20 cheese platters arranged around our very large dining room table, each labeled and described for your exploration and enjoyment. There will also be plenty of wine glasses and ice buckets for you to use with your favorite bottle of wine that you can bring to the event. (yep, it is BYO). Bring something you want to share, as it tends to become a little communal at the wine buffet. They say the best things in life are free. Personally, I prefer the saying “The best things in life happen at The Queen Victoria”. This event just proves my point. I know you’ll agree. Bring yourself and your favorite beverage and enjoy a wonderful afternoon. This event is only open to guests actually staying with us that weekend, of course. 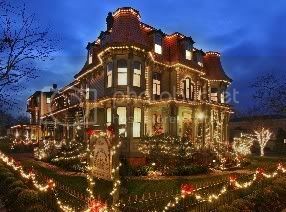 Now that Thanksgiving is behind us we can really set our sights on one of Cape May’s most incredible seasons … Christmas. 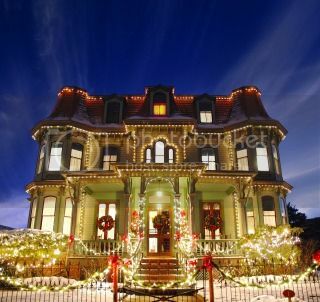 Cape May is special all year long, of course, but Christmas truly brings out the essence of Cape May’s special charms. It isn’t just the lights and decorations on the houses, or the charming little shops on the Washington Street Mall selling interesting and different items that make perfect Christmas gifts. It goes beyond special tours with innkeepers in Victorian costumes and carolers roaming the streets. It is much more than that. 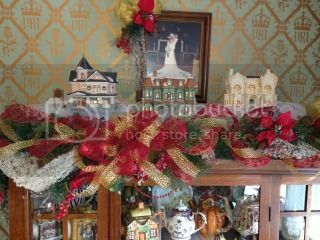 Victorian Cape May was built at the same time that Christmas was becoming popular in the English speaking world. That world has moved on and changed Christmas in ways that many of us regret, leaving Cape May, with its old world charm, leisurely pace, and friendly atmosphere, to celebrate Christmas much as it was celebrated in a much simpler time. When our visitors return to Cape May for the Christmas season, it isn’t about Santa Claus and gifts and feasts (though we do tend to focus on food a lot). People are drawn here for Christmas to enjoy a few days of leisure in the company of their loved ones, family and friends. They have the time to enjoy the charms of the Christmas season without a deadline or any pressure at all. They get to truly enjoy the season. The last time Anna Marie and I stayed in Mayfair we ended up buying The Queen Victoria. What better recommendation can I give you about a room than that? We loved everything about it. It is interesting to note that it is also the first room we decided to redecorate the following winter, as it was getting a little “tired”. We like it even better now! When we stayed in Mayfair that weekend it was COLD. How cold? About 20 degrees, which is very rare for normally temperate Cape May. I mention this because my first impression of the room was how warm and cozy it was. It is a bright room which gets lots of sun all afternoon long. It is also filled with beautiful antique furniture, including an absolutely gorgeous Victorian sofa and beautiful marble top dresser. 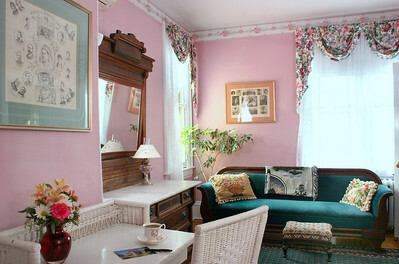 It is also a spacious room with a 4 poster queen sized brass bed and a writing desk to sit at while you are writing out post cards telling all of your friends and family about your visit to Cape May (on a Queen Victoria post card, of course). Mayfair is located on the 2nd floor of the Prince Albert building, so you may have to suffer through the mouth watering aromas of our tea treat baking. Some things in life are so unfair, aren’t they? Check Out All of Our Guest Rooms! One of Cape May’s newest attractions is its new micro brewery. Cape May Brewing Co. opened its doors last summer with very limited hours. In fact, they were only open on Saturdays, which might explain why I still haven’t been there. I know at least a few of you have made your way to Cape May airport to check it out for yourselves. Perhaps you’ve sampled some of their brews in one of our local taverns. 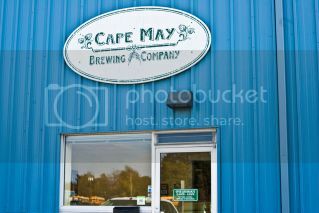 So the big news for Cape May Brewing Company is that they are now open 4 days a week. Anna Marie saw an advertisement in the latest edition of Exit Zero this week announcing their “all new” tap room (still at the Cape May airport), open Wed & Thurs 4-8pm and Fri & Sat 12-8. With their expanded hours, I’m looking forward to checking it out myself! For a couple of years now facebook has been a great way for me to keep in touch with our guests on a frequent basis. It is fun to share pictures & info with you and see your feedback. It turns out that facebook is not the only Social Media network anymore. In fact, before long Google+ may well be much more popular than facebook (who knows). Anyway, if you are a Google+ user, then please add us to your circles so we can keep in touch with you too. I’ll keep you updated with great pictures, Cape May news & events, and great specials at The Queen Victoria. How could you possibly resist all of that? OK, so I lied. I had to sneak in one more Christmas feature. How could I possibly resist posting a photo like this in my Christmas newsletter though? 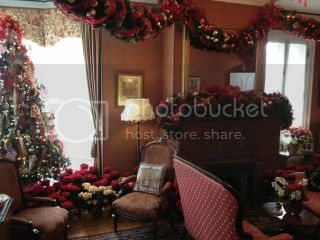 This photo was taken by one of our guests last year shortly after we decorated for the season. You can see dozens of our signature “Winter Rose” poinsettias wrapped around the Christmas tree. Each year we buy a enough of these beautiful flowers so that we can sell them to our guests. In years past we sold so many that we ran out and didn’t have any for our own decorations, so this year we ordered 150 of them. 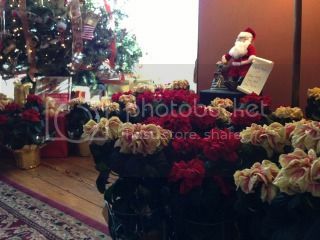 That is a LOT of poinsettias, believe me. If you’ve visited us during the Christmas seasons in years past, you may have had the opportunity to enjoy one of Cape May Stage’s hilarious Christmas productions. Perhaps you recall “Every Christmas Story Ever Told”. It would appear that this Year’s Christmas production is as funny as that, which is saying a lot. 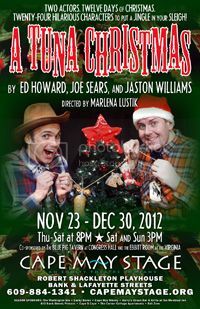 It’s time to kick up your heels with A Tuna Christmas, the hilarious sequel to the hit comedy, Greater Tuna. It’s 24 hours before Christmas and times are tough. Bertha Bumiller’s drunken husband hasn’t come home, her kids are messes, and a Christmas Phantom is destroying the town’s decorations. Two actors. Twelve days of Christmas. Twenty-four hilarious characters to put a jingle in your sleigh. Stuff your stocking with a Tuna surprise this holiday season! ‘Tis the season for great value at The Queen Victoria. If you’re looking for an inexpensive escape to Cape May between now and the end of April, you’ll be interested in this. Restrictions apply, of course, so be sure to visit our website and find out all the details. You’ll be thrilled and amazed at the packages we’ve designed for you to enjoy. I don’t think it is ever too early to start planning for a fun weekend, so I just had to feature our newest event again this month. On Saturday, March 16 (OK, 1 day early) we’ll be celebrating St. Patrick’s Day in a fun new way. I’ve recently acquired an affinity for Irish Whiskey (in moderation, of course) and it occurred to me that I could parlay it into a fun event. 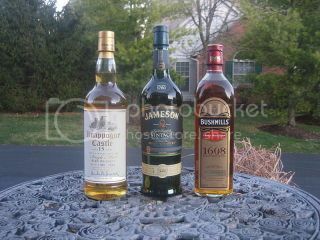 What could be more appropriate than an Irish Whiskey Challenge on St. Patrick’s Day? It seems like a perfect match. Now I’m guessing that anyone interested in attending this event already has a favorite Irish Whiskey. If each of us brings a bottle of our favorite, mine happens to be Tullamore Dew, we’ll all have a chance to sample and evaluate everybody’s favorite. I wouldn’t be surprised if a few of us change our opinions in the process. I’m guessing we’ll have a few duplicates, but I’m sure that won’t be much of a problem. We’ll be providing a selection of traditional St. Patrick’s Day fare, so we’ll all have something to eat to get through this event. There are a lot of things that we love about Lucky Bones. First of all, the food is always wonderful. I wouldn’t be telling you about them if that weren’t true. Beyond that, Lucky Bones is open 7 days a week, all year long, with the exception of certain holidays. The atmosphere is fun, and the food is reasonably priced, as is the wine list (you know that would be important to me!). Another thing I love about Lucky Bones is that their menu is very diverse, spanning from pizza and sandwiches all the way to incredible entrees. It is simply a relaxed, fun place to dine. Over the years since the Craig Family (as in Washington Inn) opened Lucky Bones it has certainly become a favorite of locals and visitors alike. Though Anna Marie and I have tried lots of different things on their menu over the years, we certainly have some favorites. Anna Marie’s all time favorite is the Grilled Chicken BLT sandwich, a grilled breast topped with black pepper bacon, lettuce, tomato and herb mayonnaise on focaccia . My favorite is also a sandwich … the Filet Tip, which is stuffed with roasted peppers, caramelized onions, mushrooms, provolone cheese. Is your mouth watering yet? 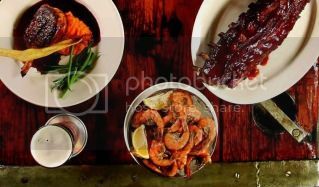 I was just admiring this photo which I swiped off of their website and I decided that I probably have to try the ribs next time we go there. Wow, those look great!